Needless to say, this is a kale lovin’ blog. I love kale. My beloved loves me and therefore, he has to love kale by default, even though I caught him “whining” to my friends that kale is all I cook when it comes to green vegetables of late. He is such a brave man, isn’t he? 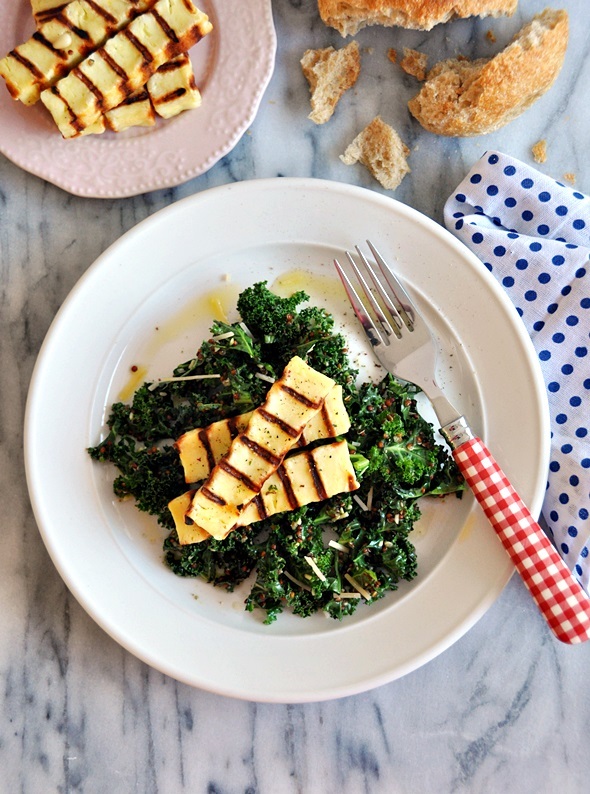 The irony is …well… hello to another kale recipe! This time I’m not tip toeing around the chlorophyllic taste kale by sautéing in garlic infused olive oil. Let’s go raw kale shall we? I know raw kale is not everyone’s cup of tea. Let’s get rid the “raw” word as it seems to freak people out. To make raw kale tasty, I marinated it with homemade basil pesto. Let’s hope that words like “marinated” and “homemade” will make raw kale sound more appealing to you hey? Cook quinoa: Combine ¼ cup quinoa and ½ cup recently boiling water in a small pot and cook until 90% water has evaporated. Cover the pot with a lid and allow the quinoa to absorb the remaining liquid. Set aside. 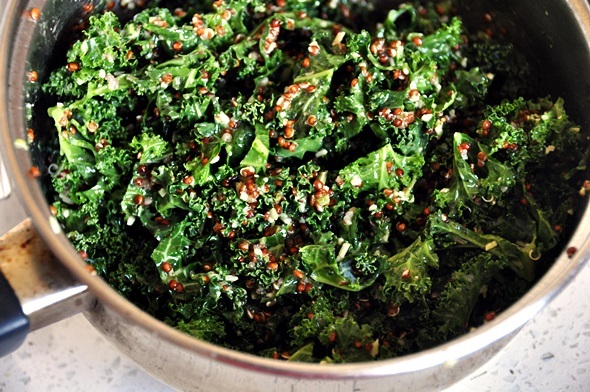 Marinate kale: Add basil, garlic, pine nuts, grated parmesan and olive oil in a food processor. Process until finely chopped and emulsified. 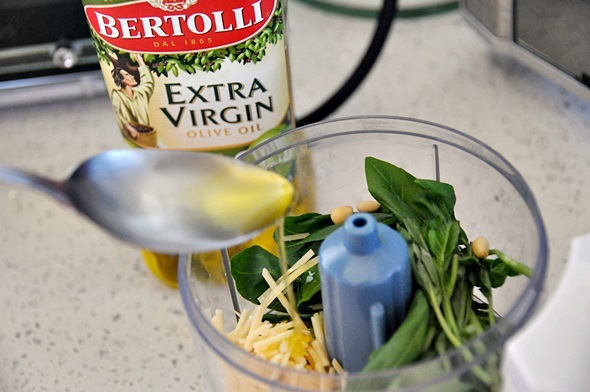 Transfer the pesto in to the pot containing the quinoa and stir until well combined. Add finely chopped kale and toss to combine. Set aside to allow the kale to marinate. 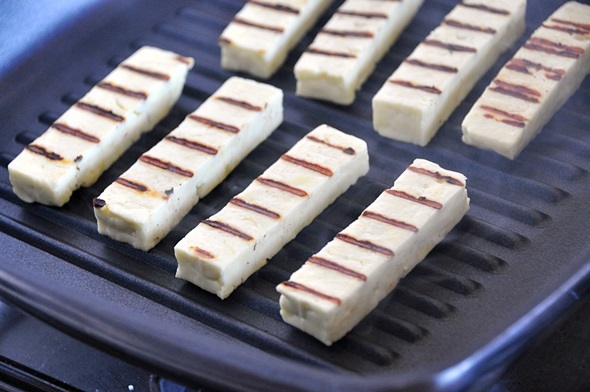 Grill the haloumi on a dry pan (no need to grease the pan) until all sides are beautifully charred. 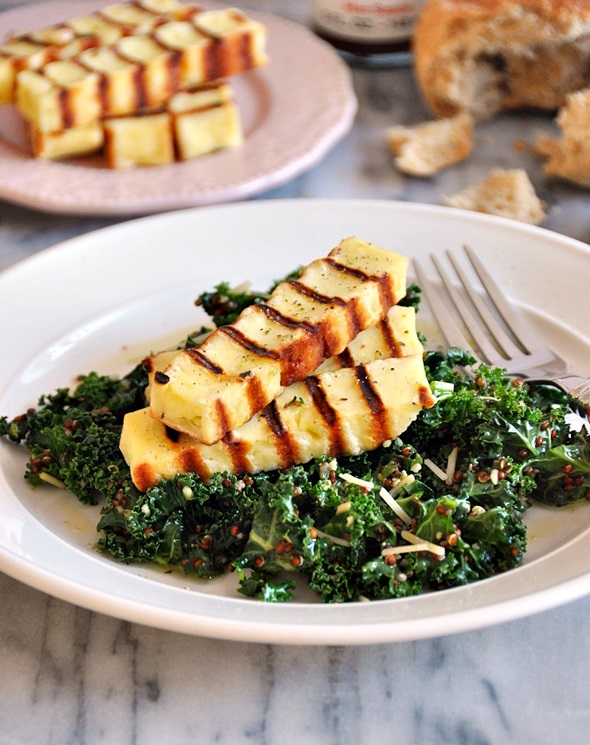 To serve, pile the marinated kale onto a plate and then top with grilled haloumi. 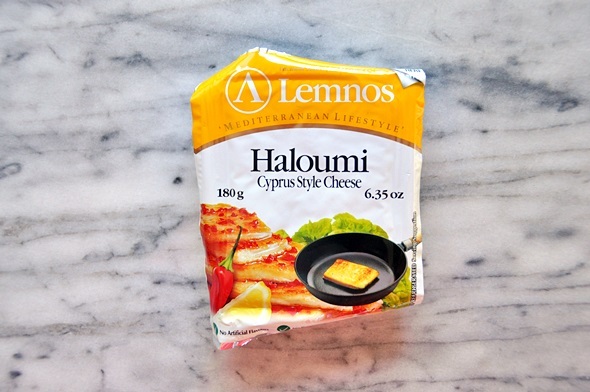 Finish with a light drizzle of olive oil and splashes of hot sauce if you like. Do you like kale? If yes, what’s your favourite kale recipe? Looks deliciously tasty! I love raw kale in salads with dried cranberries, apples, nuts and a orange vinaigrette dressing!